As I mentioned in a previous post, because they are not willing to understand that it has been designed by an incredibly intelligent and powerful Designer, evolutionists are forced to look at nature in a ridiculously simplistic way. Take the naive evolutionary idea that brain size correlates with intelligence. Because evolutionists can’t appreciate the incredible design that went into producing brains, they generally assume that the smaller the brain, the lower the intelligence of the organism. Nearly a year ago, I reviewed The Design of Life , which discusses some powerful evidence against this silly notion. Recent research1 on bumblebees has just added more evidence to the pile. The question the authors wanted to address was how the bees arrive at their preplanned “trapline” route. Do they just visit the flowers in the same order in which the flowers were originally discovered, or is there more thought given to the process? In the end, the researchers were able to show that there is a lot of thought devoted to the process. In the cleverly-designed experiment, the authors used artificial flowers that gave only a certain amount of artificial nectar. This forced the bees to move from flower to flower rather than just eating their fill at any one of them. They presented the bees with a total of four flowers, and they watched how each bee visited the flowers. First, they put all the flowers together in a patch, and then they progressively moved three of the flowers away, so that in the end, the four flowers were in different locations, each separated by a reasonable distance. This is perhaps more impressive when we consider that the bees appear to optimize their flight routes despite the presence of both conspicuous landmarks (placed near flowers to facilitate the retrieval of landmark sequences in the entrainment order) and scent marks that should have favored the stabilization of the suboptimal—discovery order—route. In other words, the researchers tried to get the bees to visit the flowers in the order in which they were discovered. Instead, the bees ignored the cues left by the researchers and deliberately reordered the sequence of flowers so as to make the total distance they had to travel as short as possible. 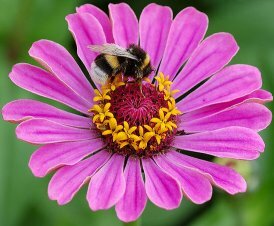 Bumblebees can find the solution to a complex mathematical problem which keeps computers busy for days. Such a statement is more hype than science. In the experiment, the bees figured out a optimal strategy for visiting four locations. While that clearly shows the bees are able to solve a complex problem, a four-location-traveling-salesman problem doesn’t take a computer days to solve! So to imply that the bees are as good as or better than a computer at solving such a problem is seriously overstating what the data say. There is a common perception that smaller brains constrain animals to be simple reflex machines. But our work with bees shows advanced cognitive capacities with very limited neuron numbers. That is very well said, and it flies in the face of the evolution-inspired nonsense that a small brain means a low intelligence. In fact, because of the amazing Creator who designed brains, size probably doesn’t correlate to intelligence in any way. Just as my current laptop computer is significantly better than my current desktop computer, intelligently-designed systems do not lend themselves to a overly-simplistic categorization processes. Small brains can be incredibly intelligent, because they have been designed by a truly incredible Intelligence! Amazing. Can I have a bee in my Discrete Mathematics exam! Initially I wondered if it might not be simply generalizations such as go to the nearest available flower from here, but it seems that the flowers were positioned to make that strategy non-optimal. It isn’t so much calculating the best route as retaining the results of experimental journeys, but that is of itself an impressive feat for a bumblebee. What I think is most incredible is that they don’t in fact stick to their optimal choice, but instead take occasional detours in case the environment has shifted and a better route is available. Shame that the poor little fellows had to be frozen solid after the whole event. Josiah, thanks for your comment. I originally wanted to write about the fact that the bees would “try out” new routes from time-to-time, but I couldn’t get it to fit well in my article. I am glad that you brought it up. You’re absolutely right! This explains why it is commonly held amongst evolutionists believe elephants are much smarter than humans! Though you get points for trying to be rational about what the data say and what is just hype, your initial claim is a straw man. Cranial capacity within primates is a useful coarse proxy for intelligence as other metrics are unavailable when dealing with fossils. It is a straw man to assume that biologists turn this limited inference into a general principle that extends to all animals. It is a lie to the general public to insist that evolutionary biologists actually believe what you’ve attributed to them. Terribly unchristian to lie, isn’t it? It is terribly irrational to try to comment on a subject about which you have not educated yourself. Talk about ‘busy as a bee’!! This actually reminds me of a Mythbusters episode where they tested the ‘bird-brain’ saying, and discovered that birds are actually pretty smart. Makes me wonder if Stegosaurus Peanut Brain was as dumb as the books would have us believe. Miranda, you are right to wonder about what the books tell you when it comes to Stegosaurus. Since there is probably no correlation between brain size and intelligence, Stegosaurus was probably not nearly as dumb as the books portray. Given that brain size is a relative measurement, how large are bee’s brains actually? Bumblebees have a relatively small brain – they have about 950,000 brain cells, humans have 100 billion – but they can achieve rather impressive feats of learning and memory given what they have got. Several of the popular articles that commented on this study say that a bumblebee’s brain is the size of a grass seed, but I don’t know where they got that factoid. Whatever the details, the evolutionary expectation is made clear in the quote that I give from another one of the authors (Dr. Mathieu Lihoreau). He says that we EXPECT a small brain to constrain an animal to be a “reflex machine.” This study simply shows how wrong that expectation is. Another Confirmation of Quantum Mechanics Thank God for Whale Poop!